Sub: One–way request transfer on out–of–turn basis. 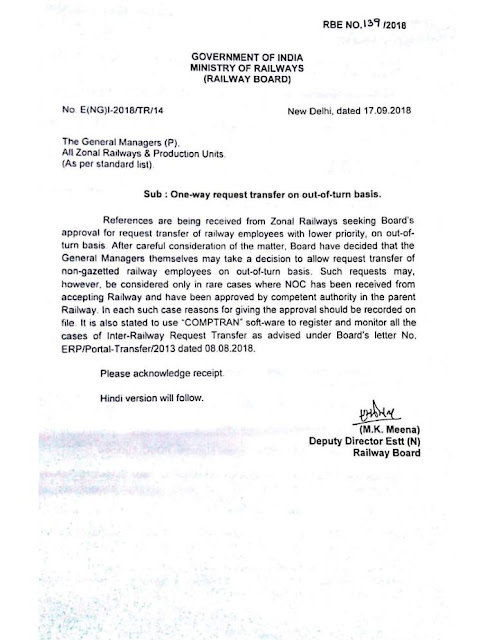 References are being received from Zonal Railways seeking Board’s approval for request transfer of railway employees with lower priority, on out-of-­turn basis After careful consideration of the matter. Board have decided that the General Managers themselves may take a decision to allow request transfer of non-gazetted railway employees on out-of-turn basis. Such requests may, however, be considered only in rare cases where NOC has been received from accepting Railway and have been approved by competent authority in the parent Railway. In each such case reasons for giving the approval should be recorded on file It is also stated to use –COMPTRAN” soft-ware to register and monitor all the cases of Inter-Railway Request Transfer as advised under Board’s letter No. ERP/Portal-Transfer/2013 dated 08.08.2018.